*Reposting this with a new Picture. 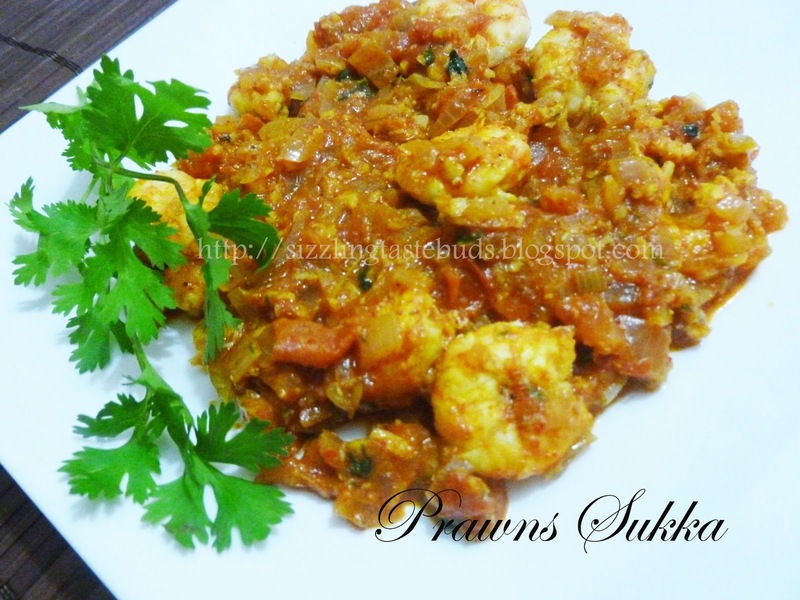 Prawns Sukka is a traditional, delicious coastal Seafood dish. Once my friend asked me this recipe and i gave her this recipe with a note saying that you can skip adding grating coconut to this. She replied saying that how can you say the recipe is coastal and and you can skip the freshly grated coconut to this. Actually she had a point. I usually try avoiding coconut in my cooking and thats the reason I said that. Well! not its all up to you guys, whether you like adding coconut or just skip it. Both the ways, the recipe will surely be a hit! Garam masala (optional) 2tsp . You can skip this if you are using dhania powder or you can equalize both. I prepared this dish without adding garam masala. 2. Heat 3 tsp oil in a kadai. Add chopped onion and fry till it turns translucent. 3. Add ginger- garlic paste and fry for 3 mins. 4. Now add chopped tomatoes and cook till they become soft. 5. Add fresh, cleaned prawns along with little water. Close the lid and cook. 6. After cooking prawns for 3-4 minutes, add red chilli powder , salt, grated coconut and dhania powder. 7. Mix well and close the lid for the prawns to cook for another 5 -6 mins in medium flame. Add more water if needed. 8. Lastly add little fresh coriander leaves ( chopped) and mix well or garnish with coriander leaves. Hot and spicy Prawns sukka is ready to serve. Serve this with Rice or Neer Dosa. I made Prawn Sukka Masala. It turned out very yummy and delicious. Thanks for the recepie. This seafood dish looks terrific. I'd love to have coconut in mine since I am a coconut lover.